If you bought an Amazon FireStick and you’re wondering what cool things Kodi can bring, you’re in the right place. As you know, there is nothing more rewarding than messing around with a new gadget to see what it is capable of doing. Amazon has done a good job of making sure that FireStick users could use it in many ways without major changes. In addition to the native applications installed, this TV Box in the form of Stick also offers access to all Amazon Prime content for subscribers, as well as the ability to install very complete and varied third-party applications like Kodi. With that in mind, we’re going to install and setup Kodi on Amazon FireStick. 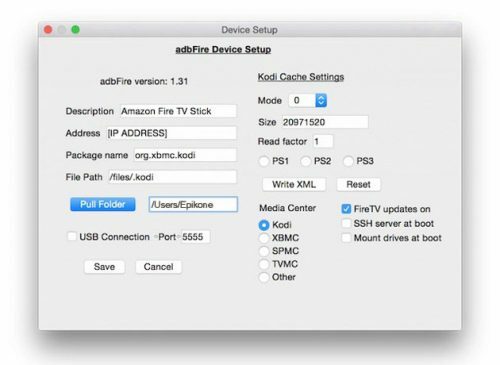 Amazon FireStick: This guide will be used to install Kodi on any Android device, so if you have the Amazon Fire TV Stick, this process will also be valid. A computer: Which can be any PC with Windows, Linux or Mac OS X. The tools used in this guide it’s working for all platforms. Internet connection: You will also need that the WiFi is in operation, since both the Amazon FireStick and the computer will need to connect to a WiFi network. 15 minutes of your time: As you can see in this guide, you will need to download some applications, as well as perform the installation of them through a WiFi network. And it’s time to go directly to the install process. To make the process as simple as possible, we have divided it into three different parts. If you already know what Kodi is all about, you can skip some parts to go to the end of each section. As I mentioned earlier, the Amazon FireStick works by default with a modified version of the Android operating system. It is highly adapted to meet the requirements of Amazon’s product, but deep down, it’s still Android. That means that, like other Android devices, we can install any application, although first we need to perform a previous configuration. Using the Amazon FireStick remote control, go to the “Settings” screen and then “Device“. In the Device panel, look for the preferences of “Developer options” and click on the button to enter. 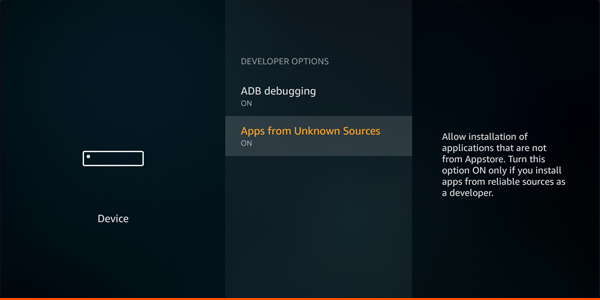 Within the developer options, you will find options such as “ADB Debugging” and “Apps from Unknown Sources“. Make sure both options are activated. Use the arrow from the remote control to go back to the base configuration of the system Settings. Look for the “About” option, then go to “Network Options” and click on the button to enter this menu. Save the IP address of your Amazon FireStick. You will need it to connect your computer to the device via WiFi. Note that the Amazon FireStick must be connected to the Wi-Fi network in order to display the IP address. 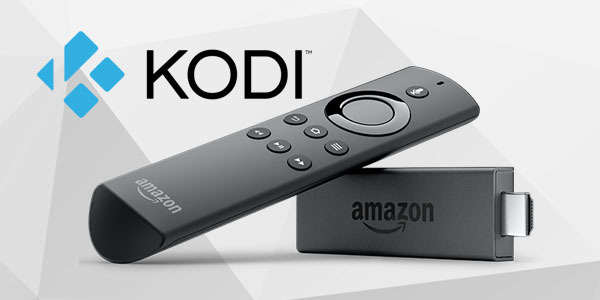 Your Amazon FireStick is now ready for Kodi. We’ll now move on to the second step. Now that your streaming device is set up, make sure that you can create a connection via WiFi through your PC. There are a number of methods to connect the Amazon FireStick to a PC, but some of them involve a lengthy process that involves the installation and configuration of the Android SDK, something that goes far beyond the scope of this guide, especially if you only want is to install Kodi and configure the Streaming options. If you do not have the Android SDK installed or you do not have the necessary technical knowledge for it, there is an application called adbFire that will solve the problem. This application is available for Windows, OS X and Linux, so you can always install it. Go to the adbFire page and download the version corresponding to your operating system. If you want, you can also learn a little about the features offered by this application, such as the SSH connection without password or SFTP access, as well as the ability to manage multiple Amazon Fire TV devices at the same time. Once you’ve downloaded the application, right click on it and hit “Open“. If you use Windows, it is probably in the “Downloads” folder. If you use Mac OS X, it will also be by default in the “Downloads” folder, unless you have changed it. Unzip the file (if it is compressed) by clicking on the .zip, .exe or the DMG file, depending on the version of your operating system. Keep in mind that, depending on the platform used, adbFire can be downloaded as a ZIP file or as a DMG. Start the adbFire application. Depending on the version, the interface may be different. 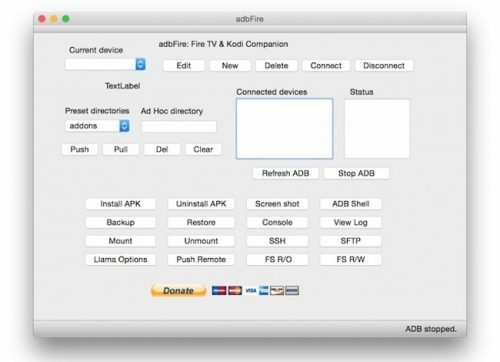 For this guide I use version 1.31 of adbFire, running on Mac OS X. If you use Mac OS X, make sure to install adbFire in the / applications folder, if not, it will show the following error “Can’t Create Logfile“. 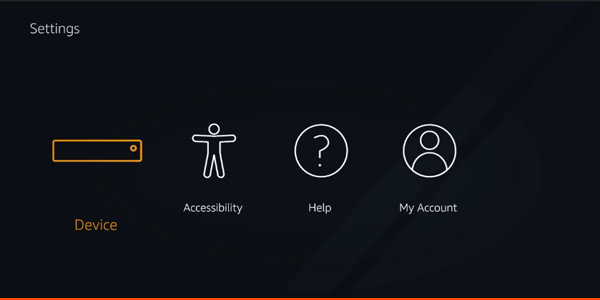 Click on the “New” button at the top, just below the text that says “adbFire: Fire TV & Kodi Companion“. In the box type the IP address of your Amazon FireStick that you saved previously. Add a description to better identify the device and click “Save“. As long as the IP address entered is correct and the Amazon FireStick and your PC are on the same WiFi network, you should have a stable connection between both devices. It’s time to install the Kodi. 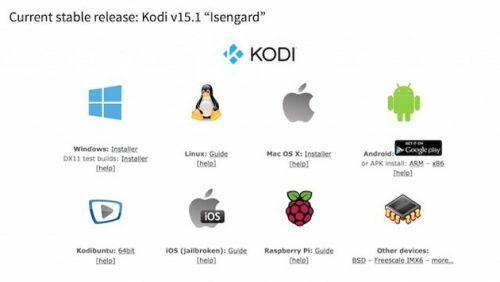 First we have to download the Kodi APK from the official website. Always download the latest version that is stable. In the main window of the adbFire interface, click on the “Install APK” button. Select the APK file that you just downloaded in the previous step and click “Yes” on the screen that will be shown to you. Now you just have to wait for Kodi to install on the Amazon FireStick. 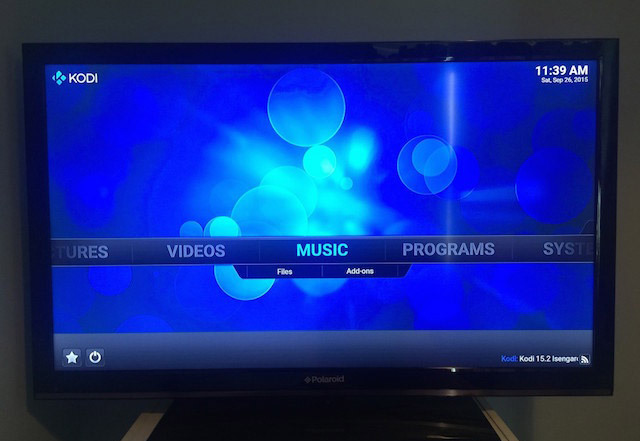 Now that we have installed the Kodi on FireStick, we must make it work, something that fortunately is very simple. Using the remote control, go to the menu on the left that is on the home screen. Go to the “Configuration” section at the bottom. In “Settings“, scroll to the right and select the “Applications” option. This is the part of the system that allows users to configure applications that are installed manually. You can also see a complete list of all the applications that have been installed, either manually or through the Amazon store. From the “Applications” menu, scroll down using the remote control until you find the “Manage All Installed Applications” option and enter. Now, find the application you are looking for, which in this case will appear with the name of Kodi. Go to “Kodi / XBMC” and select the “Launch Application” option. And that’s it. Now you have a jailbroken Amazon FireStick already working perfectly with Kodi. So now you have Kodi installed on the Amazon Fire Stick, giving you easy and free access to a wide world of multimedia content. Keep in mind that all your streaming on Kodi can be seen by your ISP and Government, which means that if you stream copyrighted content like sports, TV shows, movies, and so on, you could get into legal trouble. So, to keep all your streaming activities private, you require a Fire Stick VPN. A VPN will assist in bypassing ISP throttling, Online Surveillance, and content geo-restrictions. Some VPN providers issue very clear instructions on how to install their VPN on the Amazon FireStick. IPVanish is an example of such a VPN provider.